This easy-to-assemble kit lets you build your own sound-activated moving, roaring T. rex. If movies have it right, building your own dinosaur is a lot of work. You need a mosquito trapped in amber, a way to extract DNA, and a high-tech laboratory on a remote island. Fortunately, sometimes things are easier in real life than in the movies. This sound-activated Tyrannosaurus is made of wooden pieces that pop together like a puzzle—no tools, glue, or ancient DNA required— so you can build your prehistoric beast right at home. 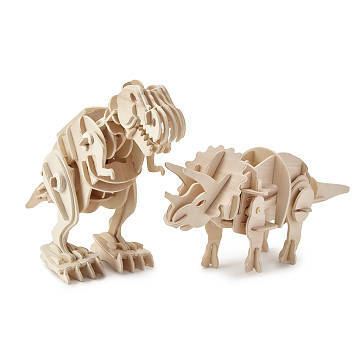 Once your wooden dino is complete, clap your hands (or let out your own fierce T. rex cry) and watch it walk and roar. Made in China. This gift looks like it will be wonderful to play with once built, but way too complicated for the listed age of 6, even with a lot of adult help.